Camelot hosts two major fundraising events each year, plus occasional smaller events. Proceeds from these events, along with donations from our generous supporters, allow us to continue to provide our services at no cost. 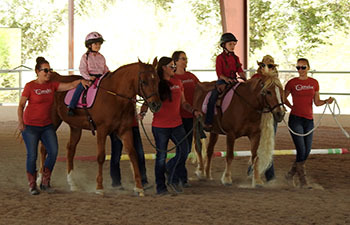 Our next event is Hooves & Heroes 2019, which will be held Saturday, April 13, at the Camelot ranch. Please also mark your calendars to check back later in 2019 for information about Starry Knights 2019, which will be held in the fall. Celebrating Our 36th Lesson Season! Hooves and Heroes is the one day of the year that Camelot opens its gates to the public. If you have heard about Camelot and have been wanting to visit, Hooves & Heroes is the perfect day to come and experience the magic of Camelot. We look forward to meeting you!! You can view photo albums from Hooves & Heroes 2017 by Ron Beliveau and Pamela Parker on our Facebook page—and be sure to “Like” us on Facebook so that you can stay up to date with our latest news. 2017 marks the 8th year of our annual fall fundraiser, which is held in the evening at a location in Scottsdale. The event includes dinner, silent and live auctions, and—most importantly—a celebration of our students and our program. Tickets are now on sale, with special pricing through October 10. Buy early and save! You can also help by donating, buying a ticket to send a student, or even sponsoring the event, all through our online ticket site. We hope to see you on October 21! Help Fill Camelot With Love! Visit our Chain of Hearts page and support Camelot by purchasing a heart in honor of, or in memory of, a special person or cherished animal. Hearts will be displayed during Hooves & Heroes and through the end of the lesson season. Please download our sponsorship form (154KB PDF) for more information.